You can tell a female is bearing eggs because her colour will turn dark. 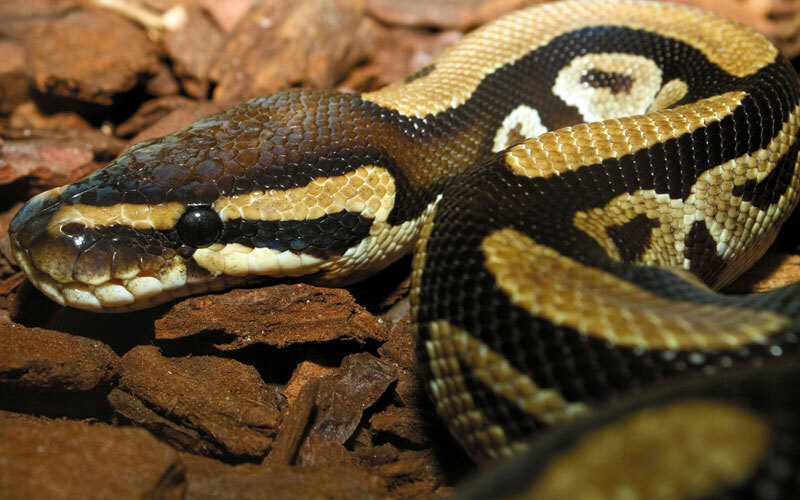 A Ball Python has a flat head and boxy snout with black and pale stripes on the face and black stripes forming a mask over the eyes. The body of a ball Python has a large spots of brown outlined in white and black. The spots on young Ball Pythons are yellow and green outlined in white and black. A healthy ball python will be round and firm and can grow up to 5 feet long. On average they will live up to 50 years. You can tell a female is bearing eggs because her colour will turn dark. They achieved the name “Ball Python” because of their habit of curling up into a ball when threatened.